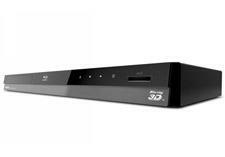 Introduced a few months back, Toshiba's BDX5200 is a 3D-capable Blu-ray player with an MSRP of $179.99. We have not performed a hands-on review of this product, but here is a more comprehensive look at its features. In addition to 3D capability, the BDX5200 sports integrated WiFi and access to Toshiba's Web platform, which includes Netflix, CinemaNow, Blockbuster On Demand, VUDU, YouTube, and Pandora. The player also supports media streaming from a network-connected server, but it does not offer 2D-to-3D conversion. • Read more Blu-ray reviews from the staff at Home Theater Review. • Find an AV Receiver in our AV Receiver Review section. The BDX5200 supports playback of Blu-ray 3D, Blu-ray Disc, DVD, CD audio, AVCHD, MKV, WMA, MP3, and JPEG files. The connection panel includes a single HDMI output, as well as composite video, coaxial digital audio, and stereo analog audio outputs. (Beginning this year, manufacturers are no longer allowed to include HD-capable component video outputs, due to copy-protection restrictions.) The player has onboard Dolby TrueHD and DTS-HD decoding, and it can pass both of these high-resolution audio formats in their native bitstream form over HDMI, for your A/V receiver to decode. You can add the player to your home network either by using the back-panel Ethernet port or via the integrated WiFi module. The player lacks internal memory to store BD-Live content; a back-panel USB port and front-panel SD card slot are provided for this purpose. These ports also support media playback. The player lacks advanced control ports, such as RS-232 or IR. • The BDX5200 supports 3D playback. • It has internal decoding and bitstream output of high-resolution audio. • It supports BD-Live and BonusView Blu-ray features. • The player has integrated WiFi. • Toshiba has added more services to its Web platform this year, including CinemaNow and YouTube. You can also stream content from a network-connected server. Read about the low points and competition for the Toshiba BDX5200 on Page 2.